Now is a good time to brace yourself for the impact of higher rates. We have been discussing the artificially low rates for quite sometime and it looks like the path to normalization has begun. 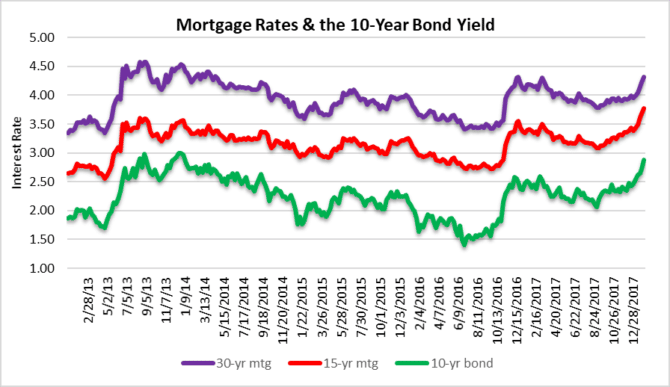 Take a look at this chart of rates, with a clear path for the 10-year bond to move closer to 3% sooner than later. That move will edge the 30-year mortgage closer to 5.00% and will effectively slam the brakes on residential real estate activity. 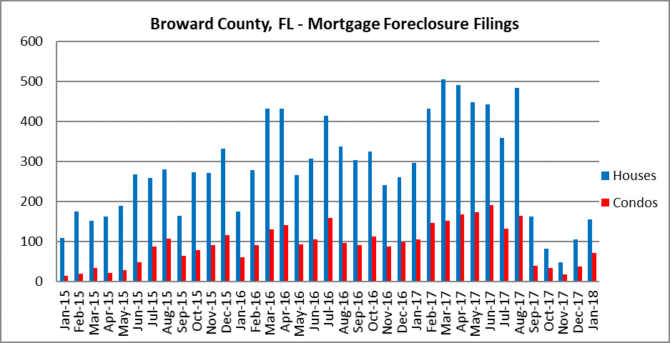 After taking another break, it looks like mortgage foreclosure filings are bouncing back. They just came off of a 90-day FEMA hold from Hurricane Irma and the banks are getting their filings in slowly but surely. 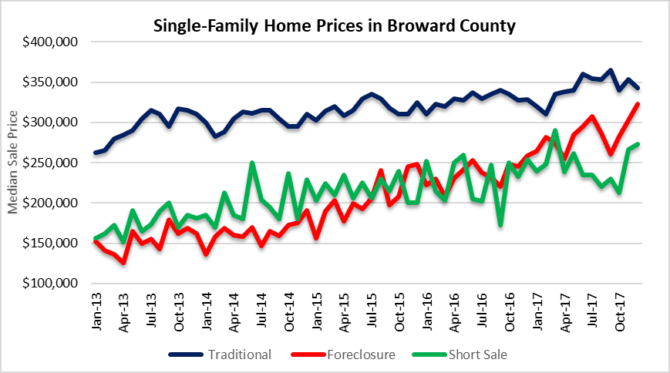 This cloud has lingered over the South Florida residential real estate market for nearly a decade and won’t be clearing anytime soon. Be prepared for average days on market and residential inventory to start increasing. Sellers and their real estate professionals won’t know why their properties are lingering on the market. Here is a clue: Drop the price, the market has changed! 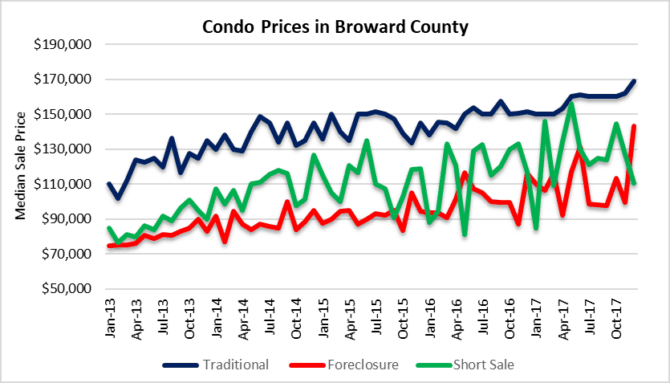 During the month of December there were 4,740 houses and 7,620 condo properties listed for sale in Broward County. Seasonality contributes to the decline in listings because many sellers take their properties off the market during the holidays. 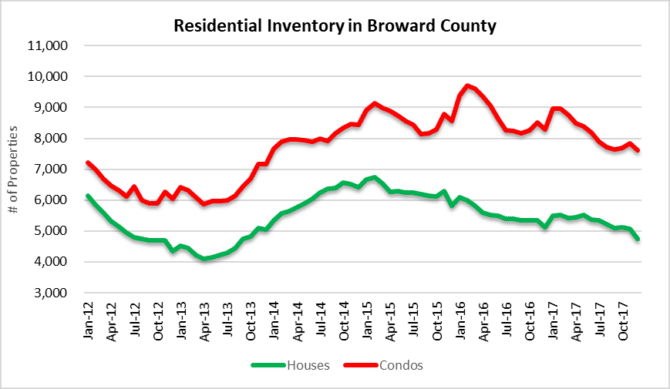 There should be a rebound in inventory which will grow throighout 2018 as properties sit on the market for extended periods. And how about price declines? The real estate market is changing, so brace yourself! This entry was posted in Foreclosure activity, Market Insight, Mortgage rates, South Florida Real Estate and tagged distressed property, Florida real estate, Florida REO, Fort Lauderdale real estate, housing bubble, mortgage rates. Bookmark the permalink. Trackbacks are closed, but you can post a comment.